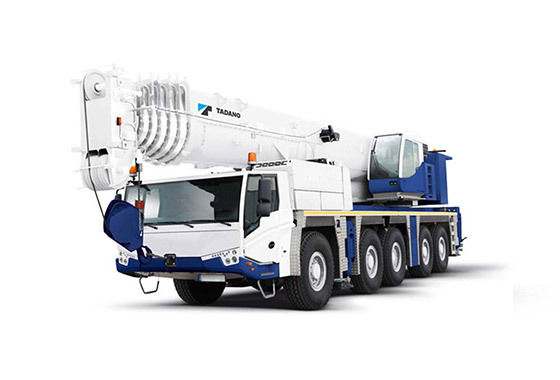 Tadano offers many all-terrain cranes, but only the 220G-5 manages to pack a maximum boom length of 223 feet into a relatively compact footprint. Thanks to a telescoping design, the boom folds away almost completely when it's time to relocate the crane. Unlike many other cranes offering over 350 feet of vertical lift, the truck base used for this unit is just over 52 feet long. There's no need to rearrange the entire work site just to get the 220G-5 close to the structure for a safe lift. This crane also features many standard safety and performance features that are only available as optional upgrades on other units. A separate operator's cab tilts and swivels to give the crane operator the best possible view of the boom and load. Not only do the outriggers set in four different positions for accurate balancing, they're also safe to operate in an asymmetrical pattern to better fit around obstacles and uneven terrain. Load movement issues are minimized thanks to the state-of-the-art Lift Adjuster system included in Tadano cranes, which manages the hoist cylinder position on the fly to prevent a moving load from hitting a structure or causing injury to workers. This minimizes the out of sight zones around the working crane, which is essential where there is limited space for operating a crane safely. For even greater safety, there are a number of optional features you can add to this already ground-breaking crane. Hoist cameras give the operator much more information about the condition of the crane and the load, while outrigger load displays are highly recommended when working on slopes and uneven ground. There's even an option for monitoring tire pressure individually to prevent a blow out from interrupting a crucial lifting operation by leaving the crane on the side of the road waiting for a new tire. Some of the best features of the 220G-5 crane are those shared by all Tadano equipment. For example, Tadano prefers a dual engine design for their all-terrain models because it preserves the less used vehicle engine while allowing you to focus more on the maintenance needs of the crane-specific engine. Useful optional features like locking upper tool boxes may not make or break your decision, but they still simplify maintenance and repairs for your team when they're at a remote job site with little access to their usual tools. With the best of German engineering and design behind all of the cranes offered by Tadano, you can rest assured that your equipment will last through decades of challenging jobs. Scott-Macon Equipment handles sales, rentals, and service for the Tadano cranes. We can help you determine whether purchase or Tadano crane rental is most effective for your particular situation. Founded in 1973, we have service centers throughout Texas, Louisiana, and Oklahoma. Our rental fleet of cranes is one of the largest in North America, and our reputation has been built on the solid foundation of sales, rental, and service support. Contact us today for more information about the Tadano ATF 220G-5 or to get a quote.